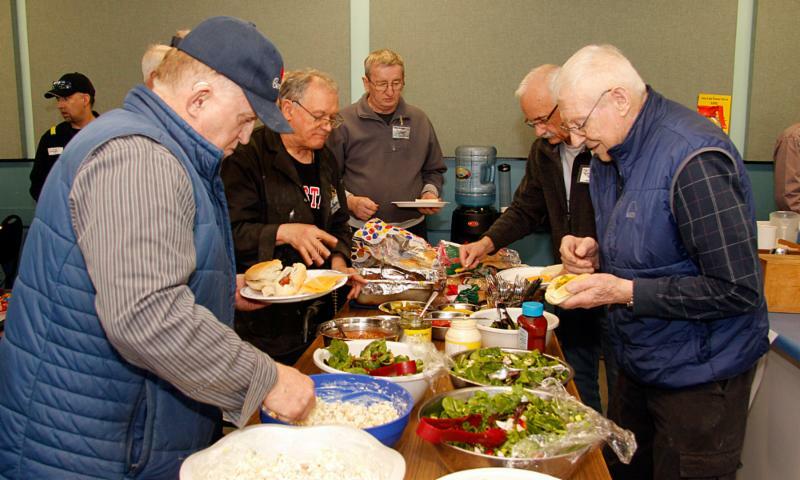 Volunteers were treated to a BBQ lunch in recognition of their contributions to the AAM. Gerry Blacklock was one of ten museum volunteers who were honoured for their large commitment of hours. 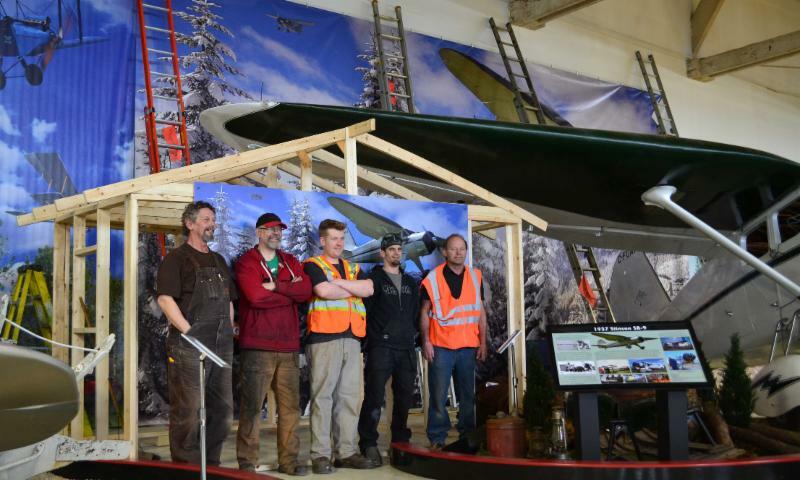 Volunteers at the Alberta Aviation Museum contributed more than 10,500 hours of work in 2016 -- equivalent to 1,250 employee-days of work. And last Thursday the museum said "thank you" with a recognition ceremony and BBQ. "We haven't always properly recognized the valuable work of these people," said AAM executive director Jean Lauzon. "But we are changing that from now on." 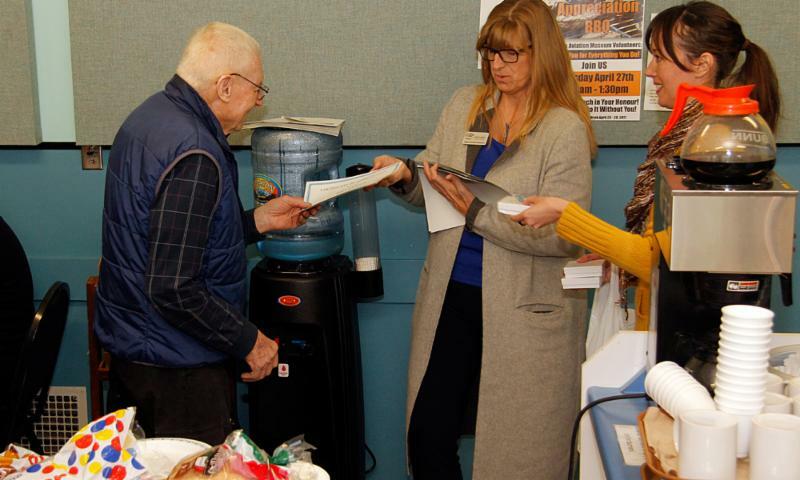 Lauzon handed out certificates and pins to dozens of those who attended the event, while emphasizing the important role volunteers play in the revitalization of the museum. "A lot of the changes would not have happened without the volunteers," Lauzon pointed out. "You see the island displays out there. You see the aircraft being restored. None of that would have happened if we did not have the number of volunteers that we do have and we need to appreciate them." In all, almost 100 volunteers gave their time, including ten who were singled out for an impressive number of hours. John Liddle, Garry Thomlinson, Mark John, Gerry Blacklock and Phil Vere each put in more than 500 volunteer hours. Bruce Ramshaw, James McQuarrie and George Nixon each volunteered more than 450 hours, while Bill Graham and Ted Mageau contributed more than 350 hours. Lauzon also emphasized that the volunteer hours play an important role in generating funds for the museum. "We've applied for about half a dozen grants and the volunteer hours logged makes a big difference on our ability to get that funding going forward." Congratulation to all our great volunteers. You help us keep Edmonton's aviation history alive. Anyone interested in volunteering at the AAM can get more details here. Aviation pioneers Rae Churchill and Chris Falconer both had an early brush with aeronautical history. Both men told their stories to our Blatchford Tales Oral History Project, which resumed in April after a break of about a year. The project has collected more than 20 stories of local pioneers who were involved with aviation in and around Edmonton. 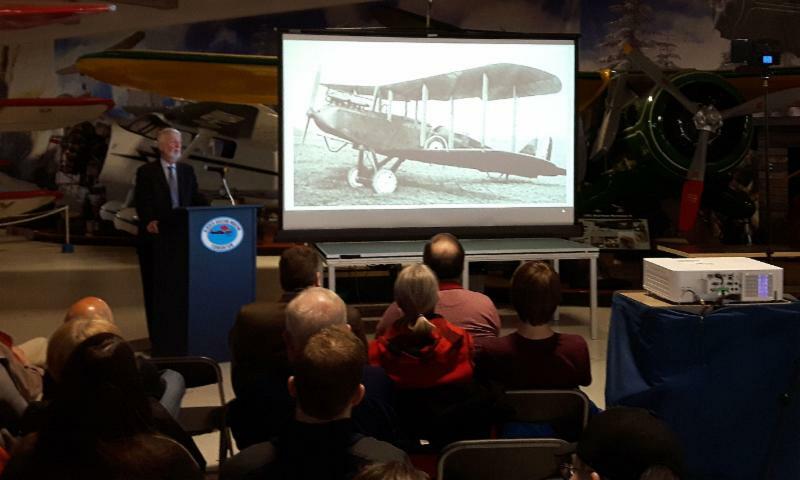 It's part of the Alberta Aviation Museum's efforts to preserve our rich aviation history and the stories of those who made it. Rae Churchill was in the crowd when Wiley Post stopped in Edmonton during his daring 1931 round-the-world flight. Churchill, who will be 97 this month, was not particularly interested in aviation during his childhood. When he was 11, he and a friend cycled from Strathcona to the airport to see the world-famous aviator "because it seemed like a good thing to do." "It had been raining and the airport was muddy, so they hauled the aircraft out onto the street. It was two-and-a-half miles long and Wiley Post [carrying 800 pounds of gas] took off heading for Cleveland." Ten years later, Churchill joined the RCAF after a war-time recruiter suggested he would be a good candidate. He spent January and February of 1941 at #16 Elementary Flight Training School (EFTS) based at Blatchford Field, learning to fly in Tiger Moths. He went on serve a stint as an instructor, then found himself in Europe flying Whitworth Albemarles and Short Sterlings, towing gliders and dropping supplies behind enemy lines. 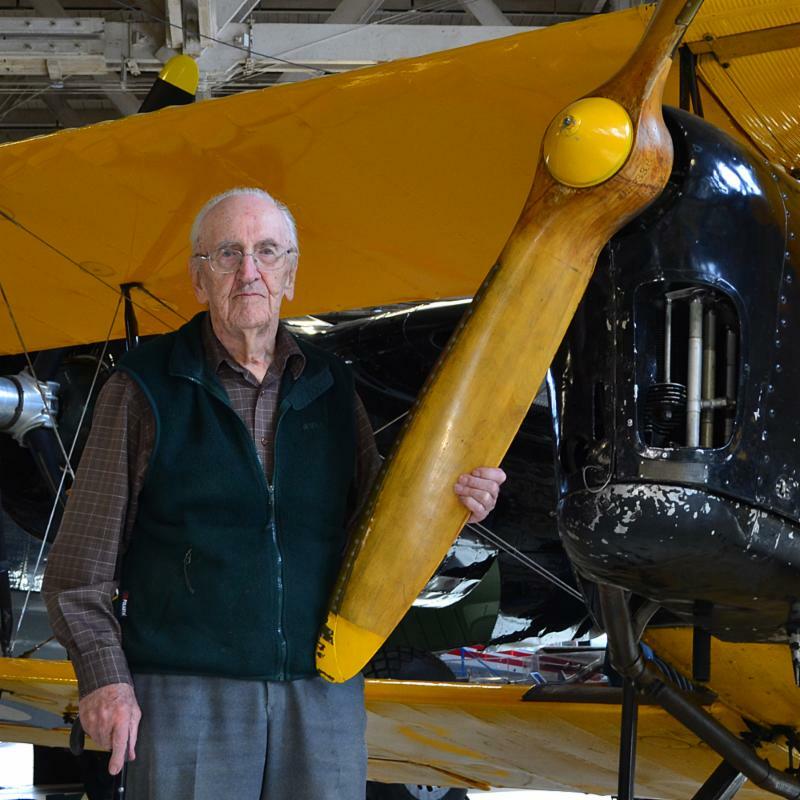 After the war he re-enlisted and spent another 21 years flying with the RCAF. Chris Falconar was only two when his father took him to the top of a hill in Montreal to see the R100 Airship during its 1931 visit. "I couldn't see it. I thought it would be big. But it was tiny. It was quite far away of course. That was my first introduction to aviation." Falconar, who just celebrated his 90th birthday, went on to study aeronautical engineering. He joined Spartan Aviation in Ottawa, but was shipped "temporarily" to Edmonton to replace a sick employee. He worked on the company's Anson's, which were being used for aerial survey and magnetometer surveys, based out of Blatchford Field. Falconar made Edmonton his home and went on to be a fixture in Edmonton's aviation community. 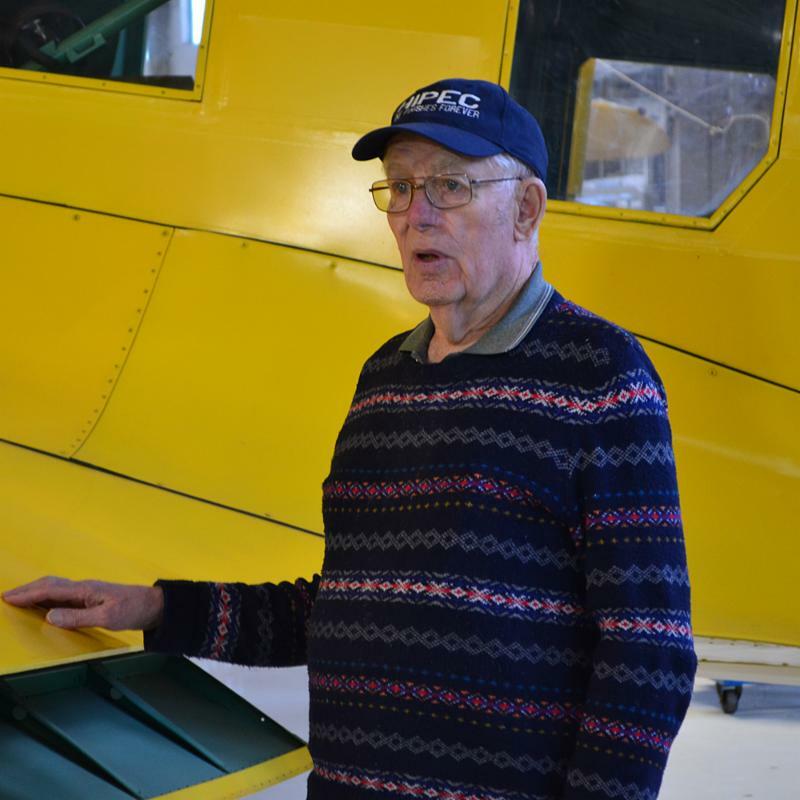 He helped start the Edmonton Soaring Club and the local chapter of the Experimental Aircraft Association. Falconer also ran his own aircraft repair business at the airport for many years, and is still a partner in a business that sells plans and supplies for home-builders. The Blatchford Tales Oral History Project hopes to conduct about two interviews a month as it moves forward. If you have suggestions about people with important stories to preserve, you can email the team here. Shorter versions of some Blatchford Tales interviews can be found on our Youtube channel, and also on display in the theatre at the front of the museum. 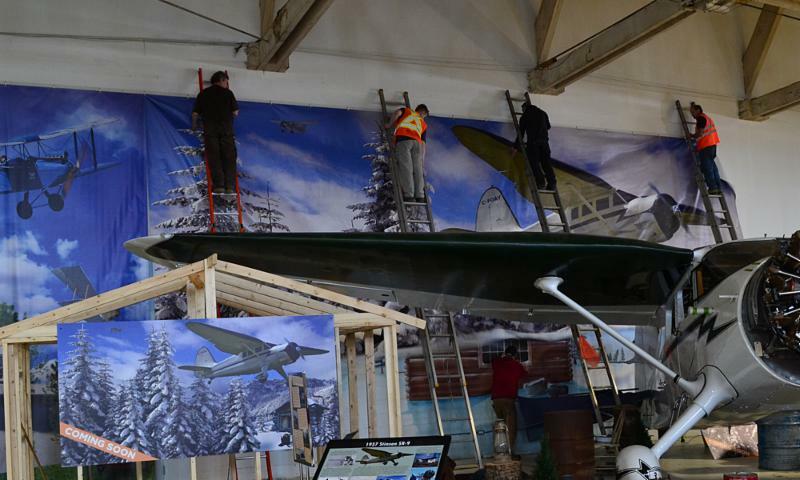 Three more background banners were installed behind the Cranwell, Stinson and Norseman. Thanks to the great work by the crew from Hi Signs. Watch a short time-lapse video of the banners being installed. 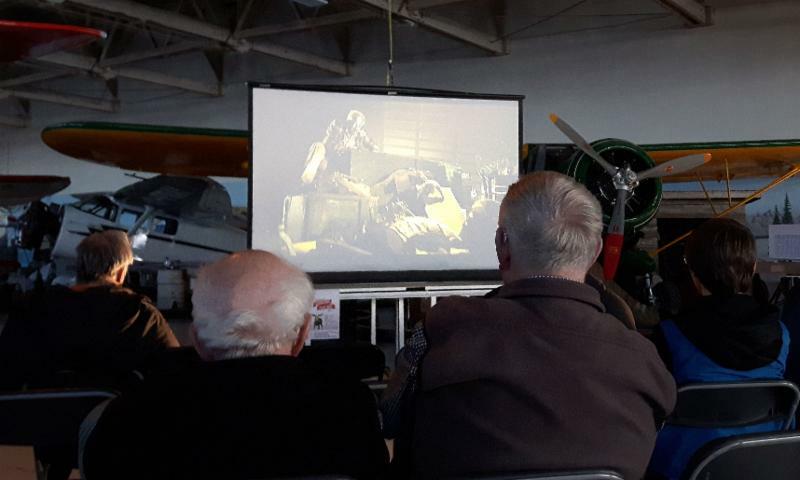 Celebrating Canada Film Day with the showing of "Billy Bishop goes to War." AAM P.resident and history prof Rod MacLeod delivering his lecture, The History of the RCAF. May 16, 10 am. 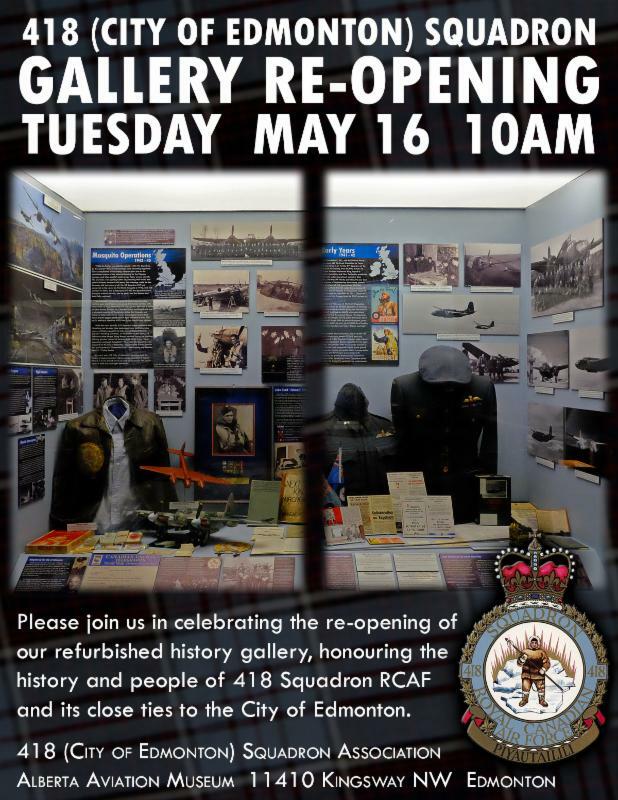 Official re-opening of the 418 (City of Edmonton) Squadron gallery. Alberta Aviation Museum. More details here. May 18, 7 pm - 9 pm. Lecture: Honouring Captain Roy Brown. 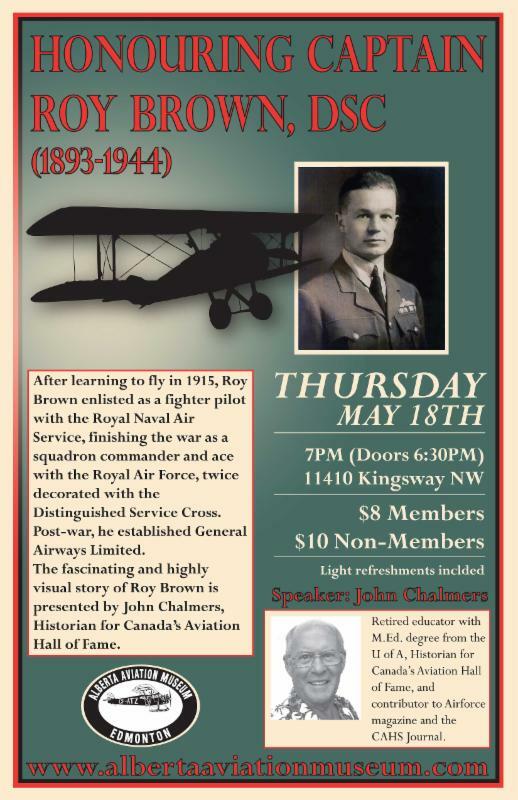 Our AAM lecture series wraps up for the season with a look at an early aviation hero with a strong Edmonton connection, as told by historian John Chalmers.Members $8, non-members $10. More details here. June 24, 10am to 4 pm. 90th Anniversary of Blatchford Field. Open cockpits, re-enactments special exhibits and more. Details coming soon.